"Robert Steven Moore (born January 18, 1952) is an American singer, songwriter, and musician. 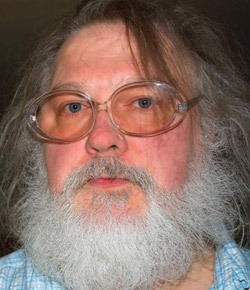 In addition to having numerous albums released on labels around the world, the prolific Moore has self-released over 400 cassette and CD-R albums since 1968, as well as dozens of home videos, mostly through the R. Stevie Moore Cassette Club, a home-based label. His eclectic work incorporates a variety of musical styles, both popular and experimental. From 1978 to November 2010, Moore lived and recorded in his apartment studios in Montclair, New Jersey, and then Bloomfield, New Jersey, before relocating to his native Nashville in December 2010. He is the oldest son of Bob Moore, veteran Nashville A-Team bassist, producer, and orchestra leader, as well as a longtime sideman for Elvis Presley, Roy Orbison and many others."